Figure A79. Scotia anomaly, interpreted as the Scotia slab, with (horizontal) [vertical] cross sections through (A)[D] the UUP07 p-wave) and (B)[D] the combined SL2013 and S40RTS s-wave models at 290 km; C) the location of the modern geological record that we interpret to have formed during the subduction of the slab. The Scotia anomaly (Figure A79) was first documented in the tomographic model of Bijwaard et al. (1998). It is interpreted to represent still-subducting South American plate lithosphere consumed at the South Sandwich subduction zone, and dips westward below the Scotia Sea. Resolution tests show that the deeper part of the anomaly is poorly resolved, and our interpretation is therefore tentative. The cause of formation of the Scotia subduction zone is puzzling. It formed within the South American plate, south of the Falkland plateau, even though the South American plate and Antarctic plate were in an extensional phase at that time and the spreading between South America and Antarctica was being accommodated at the mid-oceanic ridge in the Weddell Sea. Because subduction of the Scotia slab was for most of its history not associated with plate convergence but is fully accommodated by extension in the Scotia and South Sandwich basins, the age for the onset of subduction is best estimated from the age of the onset of extension in the overriding plate. 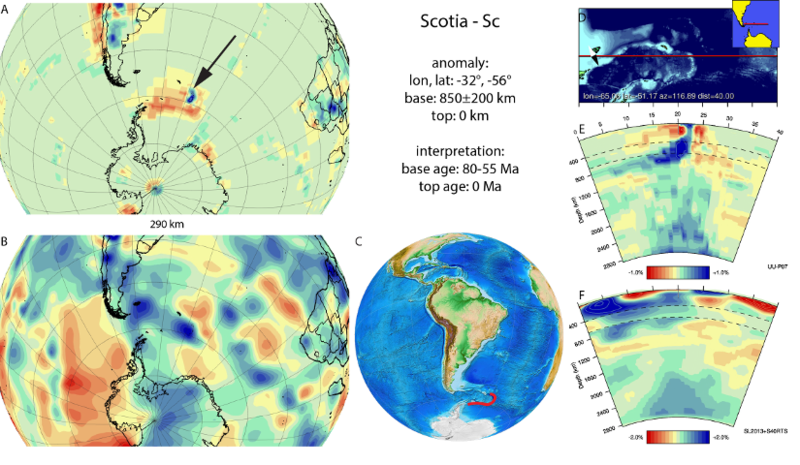 Oceanic lithosphere in the South Sandwich back-arc is Late Miocene and younger, and in the Scotia Sea is interpreted as ~27 Ma and younger (Eagles, 2005; Lodolo et al., 2006). Closing these basins juxtaposes continental fragments along the southern fringes of the Scotia Sea (e.g., the South Orkney microcontinent) with the southern margin of the Falkland Plateau, suggesting that basin formation started within the Mesozoic passive margin of the Falkland plateau that formed during the breakup of South America and Antarctica in the Late Jurassic or Early Cretaceous. This suggests that oceanization in the Scotia Sea at 27 Ma was preceded by a period of pre-drift extension. Estimates for the onset of extension in this area from Tierra de Fuego is Eocene (~55-45 Ma) (Ghiglione et al., 2008), by which time subduction of the Scotia slab must have been active (Eagles et al., 2006; Livermore et al., 2007; Dalziel et al., 2013; Nerlich et al., 2013). This episode was preceded by a phase of slow convergence between West Antarctica and Patagonia concluded from marine magnetic anomalies of the Atlantic and Antarctic oceans, which likely date the onset of subduction (e.g., König and Jokat, 2006; Eagles, 2010; Eagles and Jokat, 2014). We adopt an 80-55 Ma age range for the base of the Scotia slab. The anomalies in the Weddell Sea become younger towards the north, and are youngest at the fault zone that bounds the South Orkney microcontinent from the Weddell Sea, where they are ~10 Ma old (Müller et al., 2008). This may indicate that the originally E-W trending portion of the Scotia subduction zone to the south of the South Orkney microcontinent became inactive due to the migration of the subduction zone to the Weddell Sea ridge and consequent slab break-off, leaving the west-dipping South Sandwich subduction zone as the only active portion of the system.